Cyrillic Alphabets are utilized in the written form of a number of Slavic Languages, including Russian. 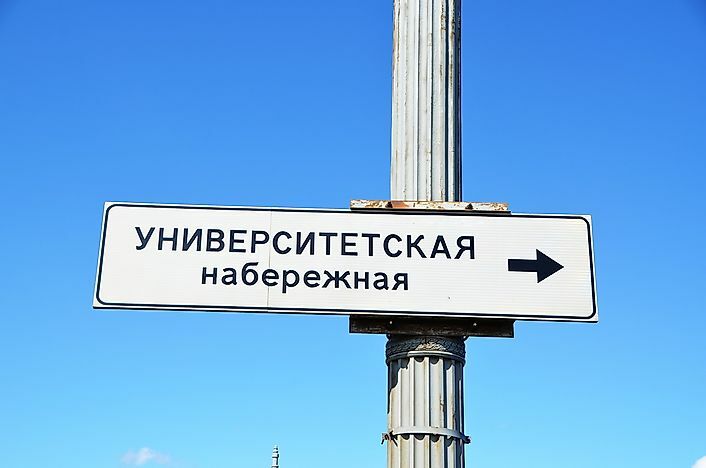 A sign in St. Petersburg showing the Cyrillic alphabet. Today, Cyrillic is known as one of the most popular writing systems of the world. It only stands next to Latin and the Greek scripts as the important official scripts in the European Union. Mostly used in Russia and Eastern Europe, these alphabets may appear challenging to learn, especially for an English speaker. One of the reasons behind the same is the weird look of some of the alphabetic characters. However, a closer look reveals that it is a mishmash of several popular words and sounds derived from Greek, Hebrew, and the old Latin. Currently, Cyrillic is in use by more than 50 languages, including Russian, Ukrainian, Serbian, Kazakh, Turkmen, and many more. The Cyrillic Alphabets also have an interesting story behind their origins. A Byzantine monk named Saint Cyril created the Cyrillic alphabet in around 683 AD. In order to Christianize the tribes of the Eastern Europe, as ordered by their Emperor Michael III, he, along with his brother Methodius, embarked upon the herculean task of translating the Holy Bible into Slavic languages. Slavic was the native language of the Slavs who now live in Russia, Serbia, and other places. The translation was extremely tough due to the presence of many bizarre sounds in the Slavic dialect. Therefore, Cyril found a unique way to solve this problem. He cleverly took a large number of alphabets from other world languages. This formed the creation of a new set of alphabets. After the death of Cyril, Pope Leo XIII canonized both Cyril and his brother Methodius in 1881. Followers of Cyril play a major role in popularizing the alphabet. The word "Cyrillic" was derived from his name, "Cyril". Since its inception, the Cyrillic alphabet has went through multiple changes. Some of the most major ones were the changes made by the famous printer and publisher Ivan Fyodorov. He removed some of the letters, like Е and С, along with several forms of the letter О. Soon, other new letters, such as Э and Й, were also introduced into the alphabet. In 1708, Peter the Great, one of the Czars of Russia, introduced lower case characters, and made it mandatory to use Westernized letter forms. Each Cyrillic alphabetic character has a pair consisting of an uppercase letter and a lowercase letter. For example, Aa is pronounced as a, and Pp is pronounced as r.
There are 33 letters in the Russian Cyrillic alphabet, of which 10 are vowel letters, 21 are consonant letters, and two are signs. Many of the letters look very similar to those of Latin alphabets, like A, E, K, M, O, and T. However, some may have a different sound. Like the word, ‘нос’ seems like ‘hoc’, but it means nos, which implies nose. It was earlier difficult to represent the Cyrillic alphabet on modern computers. However, the release of Unicode 5.1 in 2008 improved the computer support of these alphabets. For those who are eager to learn the Cyrillic alphabet, knowledge of the Russian language can prove extremely handy, as the latter is drawn heavily from the former. It is now possible to learn the Cyrillic alphabets via online tutorials available over the web as well.